Just a reminder .Net devs this the once a year free dev event in Wagga for .Net devs – this weekend!!! 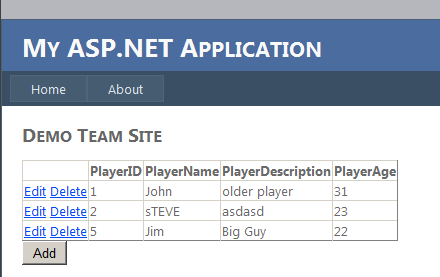 The following shows how easy it is to create simple web sites using the new Code First Entity Framework, SQL Compact Edition and Web Forms. It must be said that a number of parts of this solution are still beta, so expect the unexpected. I won’t go into either Code First Entity Framework or SQL Compact Edition but check out Scott Guthrie’s(see references) articles as they are fabulous on both topics. 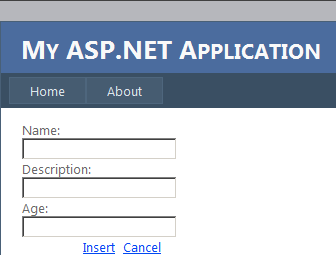 I am using Webforms initially because I find it a very quick building simple sites using ASP.NET webform controls. The site I am starting to build in this article is a sporting website for social teams. We are only going to see the very simple aspects of the Person management, but I will add more features in future articles as I switch to MVC. I’ll add the source code link up soon. I will hopefully host this solution soon and will post its link when it is up. So here we go. Ok so this is pretty simple, just two main controls. First of all the datasource. This is the object datasource for the page and all we specify is the type (or class) it is using for this datasource and then specifies the Type, the methods (edit and delete) and the parameters. The other control is the good old Gridview and as you can see we just ensure it specifies AutoPaging, AutogenerateColumns and the datakey (we need this so that the delete command can use the PlayerID to delete). Pretty simple. Here we are just adding a click event handler to move to a new page and now let’s add the only other page we need. 1.Object Datasource – again we are just pointing to the type and specifying the insert command. So nothing major here just a redirect back to the default when we have inserted the row. 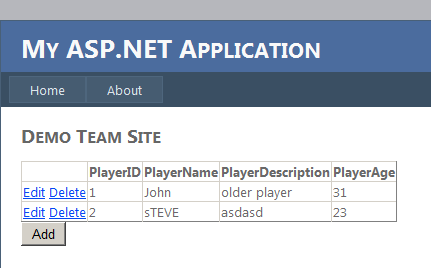 TeamWebSite – inherits from DBContext (part of the EF framework), publishes our main property: public DbSet<Player> players. Person – standard basic old POCO class. Nothing really special. WebSiteInitializer – class that we hook to from global.asax to make sure we keep the EF datamodel synced with the database. Make sure the directory exists for the datasource!!! One last thing – one of the realities of code first is that you need to be able to maintain the link between the datamodel and the database at all times. When this synchronisation is broken you’ll get errors. Our workaround for this is to go back to a base set of data – for prototypying scenarios this should be fine. So this was pretty simple but I think you get the idea that you have quickly built, a simple, self contained CRUD web application, using a range of new tools. take responsibility every job u do is a important as the last one. report back to your mentor / team leader on a daily basis. Avoid the temptation to distrust everything and roll your own. Have a desire to grok popular software components. Work like your arse is on fire! I would say one key to becoming a solid developer is to ensure that you as a developer learn to communicate effectively with both business and technical team members to ensure you are building what has been specified or is required. You can have all the technical skills in the world but if you’re not building what’s required, there is a lot of wastedtime and effort. Get a Mentor.Get code reviews from the Mentor. Maybe really great developers are born. The 7 phases of advice that follows is for the rests of us: 1.Understand your weaknesses. 2. ? * 3.Work at your weaknesses.4. Practice. 5.Email/Chat/Talk to other developers to get feedback. 6. Watch the Karate Kid 1 (learn never to give up) and 7. If you don’t drink coffee, start. In the first part of this series I indicated I would be asking some of my developer colleagues to give me a few points on what it takes to be a solid developer (Not SOLID as in the OO principles by Robert C Martin). Originally, I thought I would summarise the responses into a short essay, but the quality of the responses was too good, so instead I have just grouped them into broad categories. Also, I think its important to pick up some of the trends from the responses so if you see an item that has been repeated you’ll probably get the idea that it’s a significant issues for a number of developers. Some minor editing and formatting has taken place. Humility & Growth – that might sound like I’m being a bit hypocritical 🙂 but at the end of the day you need to learn from people who know more about any number of subjects than you. It might be new tech like mvc, generics or just business process. It might be in-house tech that the junior guy you work with knows back to front. But most of all be prepared to go back to square one and adopt new techniques like you did when you were starting out. Objectivity – the ability to stand back and look at a solution from somebody else’s viewpoint – maybe that the business stakeholder or another team. A good developer will and should eventually be a good analyst / designer so think outside your problem and assess downstream impacts and risk. A problem thought through and solved is much cheaper than a problem built, tested and solved. Don’t be precious : Sometimes you have to sacrifice your principles to get something out the door. Project influences will quite often not align with your idea of correct process. The good developers know which corners are being cut so they can be back filled when the time is right. Ability to understand the needs of the business, not just what they ask for but what they NEED. Deliver a solution that makes their lives easier. Not what is technically easiest making it hard to use while still meeting the business requirements. Be pragmatic – not wedded to any single way of doing things. Willing to explore alternatives. “It’s not the tools or framework but it’s the knowledge and principle which will take you far in your career” . So dotnet may stay or may go ..maybe Adobe will be a programming platform ..may be microsoft will fail and become extinct. But if you have the right knowledge and principles then you can pick ruby on rails and will start programming in a 2 weeks. Like my great, great mentor used to say …any technology is just 2 weeks away if you put your heart and mind into it, and it just starts with a simple “Hello world”. Be Agile : No not the programming nor the methodology but the Agile way of thinking. Ability to write simple clean code that can be easily maintained. Have a good eye for defensive programming – i.e. expect things to go wrong, test your input parameters etc, but be realistic about it. Ability to make changes to an existing system without rewriting it. Understand implications of code changes (and know when to hold back due to those implications). Understand patterns and be able to apply them. Good programmers use them without even thinking about them. Have a basic appreciation for ‘usability’ – spends more than the 3 seconds it takes to drag buttons on a form thinking about how screens / pages hang together and how the end user is going to interact with their software. A simple solution is a good solution. Keep it simple. Test it. When given a task understand the big picture. Research and then come back with a few key questions. Be driven by finding solutions – strive to be innovative – don’t ask the business to change their requirements because you are too lazy / not good enough to make it work. Take pride in your work – like a top chef who wouldn’t send out a meal they aren’t happy with, a solid developer won’t flick something to the test team without being happy that they have thoroughly tested it themselves first. Ability to problem solve and research. Recognition that you are not the smartest guy in the room (willingness to re-use other people’s solutions). Know your smell (and When in Rome do as Romans do). When you are working in a team/or organisation there are times when the managers/PM’s may not appreciate your work, style, work ethic etc. You should try to detect this. When you detect this, be prepared to change (either your job or the way you work). Take the role of the follower / leader (based on your role in the team). Understand your role in the team. If you are the grunt developer on a project don’t try to take over the lead role. If something eventuates for you in a different role for another project that’s great. Challenge yourself. Get out there and work in different industries, companies and projects. Having significant experience in multiple environments (organisations) is very significant. I am planning a third and final part to this series where I ask my mates for tips on how the junior developer/graduate/newbie should enhance skills to become the solid developer. So although this site is primarily about learning .Net and iPhone technologies I think its important to focus on how to improve yourself as a general developer. There are thousands of sites that focus on this and I won’t try to rehash any of that material. Instead, I will be talking to my developer mates, and summarising their views and thoughts on what it takes to be a SOLID developer and also what to do to achieve that level. Those involved have between 5 and 20 years experience in development. They are all excellent developers and all have a great understanding of development. Next in this series will be what makes a “SOLID” developer, stay tuned.